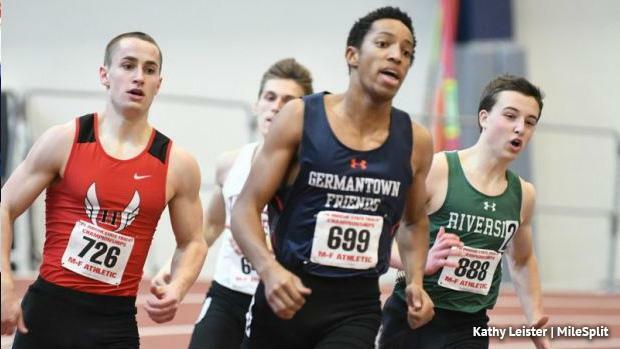 Last winter, Miles Green of Saint Joseph's Prep got his elusive state title, running to the open 400 meter state crown at Penn State. Now the door is open for a new champion in what could turn into one of the state's most wide open events this season. At the top of the returners' list is junior Kai Cummings of Germantown Friends, who enjoyed a breakthrough winter last year. Cummings, who didn't compete outdoors, went 49.20 at Yale and then came back to take fourth at indoor states in 49.55. He also ran a quick 300m last winter, clocking a 34.91. The other returning medalist is fellow junior Salim Epps of Saint Joseph's Prep. Epps went 49.86 at indoor states to sixth. Later in the indoor season the SJP 4x4 -- along with Green -- won a national title. Epps will look to keep the state title in the 2-lapper in SJP's hands. Riverside's Calvin Wetzel is the only other returner who went sub-50 last indoor season. He was ninth at states, just off a medal, so he'll have some good motivation this season. A host of others will be worth watching for this season, though. At the top of that list, perhaps, is Julian Klenner of the Westtown School. The senior went 50.64 on Lehigh's flat track at the Meet of Champs to take second. Outdoors, the PAISAA 400m champ popped some quick times, including a 47.45 in AAU over the summer. Pennridge's Andersen Dimon was another breakthrough last year. He went 50.44 indoors and then ended up taking fifth in AAA at outdoor states. He could be in line for a big senior season. Dan Whaley of the Haverford School and Brandon Vargas-Bines of Upper Dublin are a pair of seniors that were state qualifiers last year. Both could make some noise this winter. Girard College's Donovan Sanders started his impressive sophomore season last year with a solid winter. He went 50.96 at indoor states last year before running to a fourth place AA states finish outdoors. Along with Chester's Malachi Langley, there are a pair of juniors that will compete for spots near the top of the 400 rankings this season.